Having just gone behind the scenes with Long Beach residents at the Southeast Resource Recovery Facility (SERRF), a recycling and solid waste-to-energy plant, I was pleased to see that when one “googles” SERRF that you find a case study on the US Dept of Energy’s website about the project. SERRF took ten years to come on line in 1988 and is similar to plants in Germany and Japan that take waste (garbage) and burn it, clean up the gases produced and recycle the ash produced and convert the steam generated into electricity which is sold to Southern California Edison. Our tour was amazing. It began with a detailed briefing of how the plant works, its funding, its future. SERRF processes approximately 1,290 tons of municipal solid waste each day, generating up to 38 MW of electricity. It also serves as the site where law enforcement can dispose of narcotics. 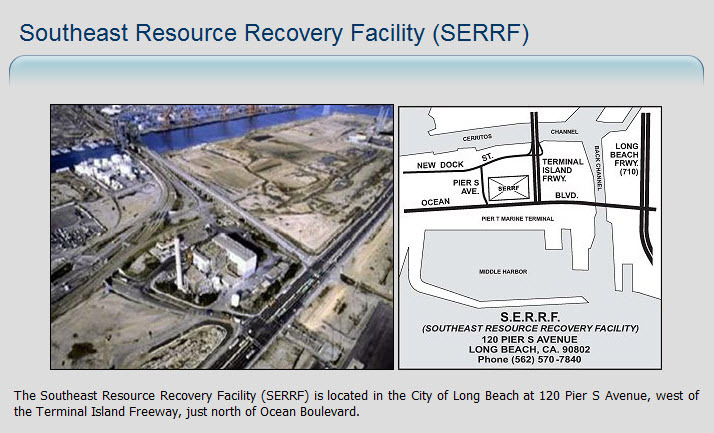 SERRF is owned by a Joint Powers Authority formed by the City of Long Beach and the Los Angeles County Sanitation District No. 2. SERRF allows a reduction in garbage being placed in landfills (Puente Hills and in Orange County) which in turn keeps charges to consumers lower than if landfills were used. Garbage trucks dump their loads and then e-waste or what is called white goods – refrigerators and washing machines are sorted out and the scrap is sold. The remaining waste is incinerated and the toxic gases and residue are scrubbed. (I saw the furnace and it probably is the closest thing on earth to what hell might look like.) The resulting ash is hauled to the landfills and used as pavement for the roads that go into the landfill. In other countries, the ash is used to pave all streets. The steam generates electricity which is sold to Southern California Edison. Unfortunately, SERRF does not yet qualify for a non polluting source of electricity which would then qualify the plant to receive carbon credits. SERRF processes garbage. Recycled goods are picked up at the curbside by a private contractor in Long Beach – Waste Management—and taken to another site where they are sorted and sold to recycling companies.